DeConcini McDonald Yetwin & Lacy, P.C. Law Office congratulates attorney Alexia Peterson on commencing her first term as President of the Young Lawyers Division. As President, Ms. Peterson will be attending the Board of Governors’ meeting on May 20, 2016, and will be a voting member of the Arizona State Bar Board of Governors. In addition, she will be representing the Arizona Young Lawyers Division at the American Bar Association Annual Meeting to be held in San Francisco this August. The Young Lawyers Division is a division created from the State Bar of Arizona specifically for new lawyers who are under 37 years of age or have been in practice for five years or less. Currently, the Division has approximately 4,000 active members in the State. The Division focus is to support “young” attorneys and to support the community’s legal needs. 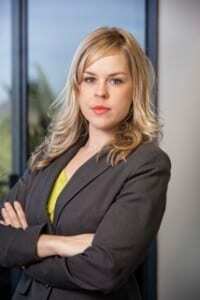 Alexia Peterson is an associate attorney in the Phoenix office of DeConcini McDonald Yetwin & Lacy, P.C. She received her B.A. from Columbia University and her J.D. from Arizona State University. Her legal practice areas are Estates and Trusts, and Family Law.